We spend most of our lives in buildings where we interact with people that occupy the same space. A common and intuitive form of interaction with others is to synchronise our own behaviour with theirs, and such interpersonal synchrony can have various benefits for our wellbeing. We present research that investigates how a new prototype of digitally-driven adaptive architecture called WABI facilitates behavioural synchrony between its inhabitants. We designed three interaction modes that each feature a unique mapping and processing of physiological data emanating from inhabitants. Qualitative feedback from a first exploratory study indicates that the different interaction modes affect how inhabitants interact and synchronise their behaviours. We discuss how adaptive architecture might contribute to wellbeing, therapy, and sports by facilitating synchrony. We thank all the participants of the study. 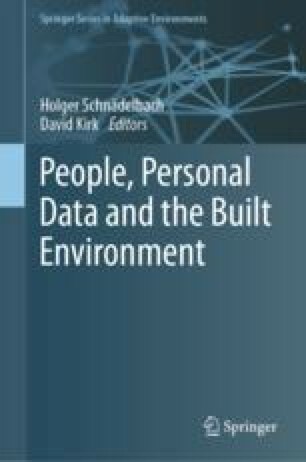 This work was supported by the EPSRC under Grant EP/P505658 and Grant EP/M000877/1; the University of Nottingham via the Nottingham Research Fellowship “The Built Environment as the Interface to Personal Data” and Loughborough University. WABI is an adaptive environment for two inhabitants that is digitally-driven using sensors and actuators. It kinetically responds to the physiological behavior (heart rate and breathing) of both its inhabitants in real time via a biofeedback mechanism. The biofeedback link—a loop consisting of inhabitant behavior, environment sensing, environment response, inhabitant sensing, and adjusted inhabitant behavior (Schnädelbach 2011 explains this loop in more detail)—between each inhabitant and WABI establishes both a coupling between each inhabitant and the environment, as well as between inhabitants. This unique physio-spatial relationship between inhabitants, as modulated by the physical structure, is its primary achievement: WABI enables two inhabitants to be collocated per our definition of collocation in architecture. Two people can be present within the same spatial unit at the same time. They are within interactional distance and share an activity. Depending on the specific data processing performed by WABI, the experience for inhabitants can vary distinctly, as we describe above. The following section contains a description of the physical, technical, and interactional features of WABI, including descriptions of the structure and motion mechanism, the hardware and software of this prototype, and finally the range of interactions this design enables. The floor plan (Fig. S.1) consists of two triangles, which are 180° rotated against each other. In this tessellated shape, the outline of WABI in its current form resembles a rhombus. From the sharp angle of each triangle, an aluminum ‘spine’ rises diagonally across the triangular floor plan (Fig. 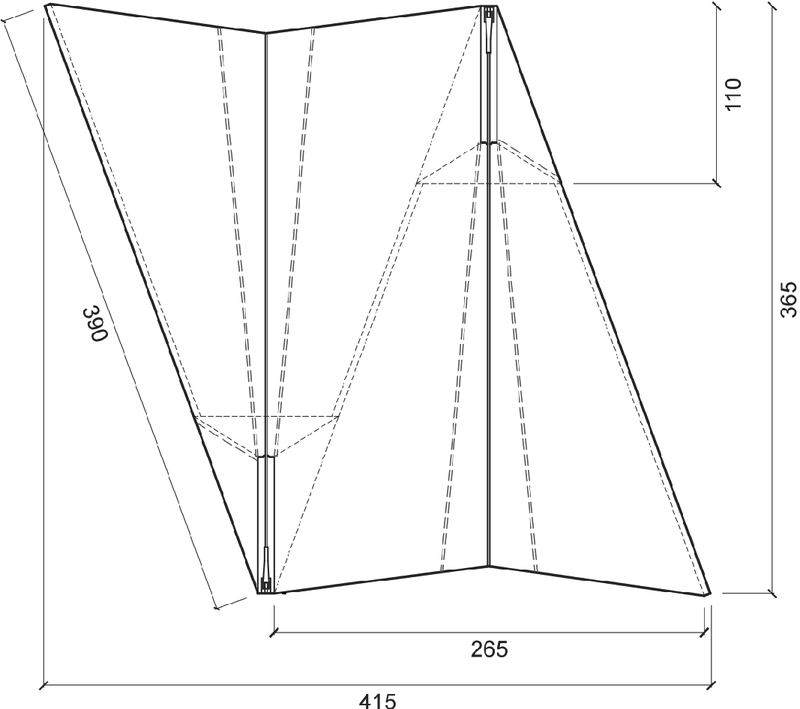 S.1) up to height of 210 cm above the shortest side of the ground triangle (Fig. S.2). Two steel tubes connect the spine with two steel tubes on the ground, which form the outline of WABI. Steel tubes of varying diameters form a triangular frame that makes WABI structurally independent (Fig. S.3). Wooden tetrahedral housing units encase the movement mechanism. Three fabric-covered LED lights illuminate the prototype with a soft yellow glow while inhabitants are present. Two LED lights are located behind each inhabitant on the left-hand side of WABI. The lights are clamped to the vertical steel frame. The LED light providing lighting from above, is suspended from an aluminium pole, which is attached to the ceiling structure. At its highest point, the structure is about 210 cm tall and about 265 cm wide. Overall, it is about 365 cm long. On the lower, narrow end, sits a tetrahedral wooden box, which houses the servomotor and arm assembly (Fig. 3.6) alongside a small video camera to record participants during trials. Each inhabitant sits under one spine, over which white jersey fabric stretches. The fabric is assembled in panels, which are connected with hook and loop tape. The modularity of the fabric allows parts of the fabric to be exchanged if WABI undergoes a reconfiguration or extension. The jersey fabric constitutes the skin of the building and partially encloses the inhabitants (Fig. 3.4). WABI is closed on two of its four sides, always to the left of each participant. The remaining two sides are open and provide entrances for each inhabitant. The initial configuration accommodates two inhabitants who are facing each other (Fig. S.2). The triangular floor plan (Fig. S.1) consisting of a symmetrical forty-degree (40°) triangle, is tessellated to achieve the current spatial arrangement in which both inhabitants sit diagonally across from each other. Thus, they are facing each other, sitting in a section of the space each. The sections are separately actuated but spatially connected (Figs. S.2 and S.3), allowing visual awareness of the other inhabitant. The name WABI describes the nature of the physical and interactive features of this biofeedback space. The word ‘wabi’ derives from the elusive Japanese term ‘wabi-sabi’, a concept of imperfect, impermanent, and incomplete beauty. [see Tanizaki (2001) and Koren (2008) for details.] Wabi alone refers to a rough, unfinished simplicity or understated elegance. But it also sometimes relates to ‘quirks and anomalies arising from the process of construction’ (http://en.wikipedia.org/wiki/Wabi-sabi).